What Is Food? Go Vegan! This Nog is a rich and frothy blend of nuts that will be an absolute favorite with family and friends. The folks at Hippocrates Health Institute were kind enough to share and I am thrilled to whip this up for the holidays! This is vegan ‘egg nog’ made with nut milks. If you don’t yet make your own nut milks, no stress, just do a search for my nut milk post. I have included links below to amazon for quick and easy shopping. 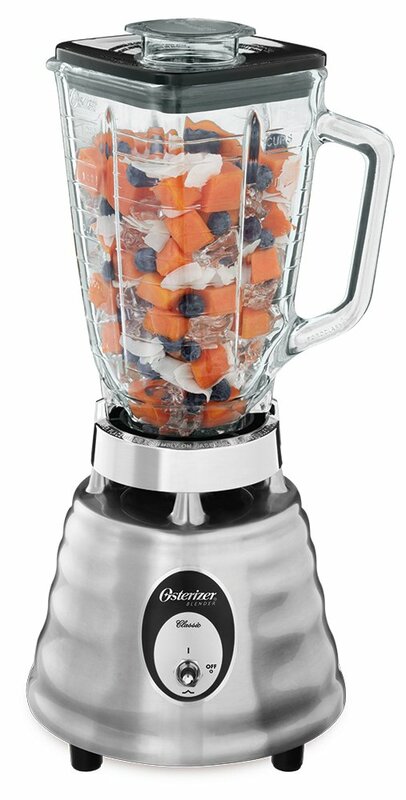 Blender This is Glass….Stainless, rather than plastics all around! Glass is always going to be safer than your plastic. Combine 2 cups of almonds with 2 cups of water, blend and strain through a nut bag. Next combine 1 cup of pine nuts with 1 cup water, blend and strain through a nut bag. Combine both nut milks in a blender, add 3 Medjool Dates, 1/2 tsp Cinnamon, 1/2 tsp Nutmeg, and 1 Tbsp Vanilla. Note: This is a thicker and richer recipe than our regular nut milk, you can use stevia in place of the dates if you want a sugar free recipe. A Glass of Chianti, Sprout Salad and Fava Beans; When Hanibal Goes Vegan. Who hasn’t seen the film? It left me wondering, for decades, one thing; what do Fava Beans taste like? And yet I could never find them. Flash forward, I did, and they are delicious in many recipes. Mmmmm Fava Beans! I bought cans of them, and dried beans for planting too. Recently, when tending my garden, a couple leaves broke off, well, I had to try them while brief thoughts of ‘ are the poisonous’ crossed my mind. These thoughts were quickly allayed by the tender buttery taste of these delightful top leaves. Yes, I’ll be back for more. And here’s a recipe using the leaves, as I found myself still alive and feeling strong enough to google search. I plan to use the leaves in salad primarily because cooking (above 118) removes nutrients and active enzymes from the food. Fava Beans can be a real challenge to find. so below in the coloured ink is an amazon link for the Fava’s. I am very excited to finally be growing them and enjoying them in many dishes. I’m doing a hummus next! Most of us were not taught the importance of enzymes in our food and how cooking destroys them. Whenever you cook anything above 118, you lose the enzymes and much of the vitamins too. Combine this with the general sadness of our air, water and soil and you have a tsunami of dietary deficiencies. We no longer rotate our crops, let the soil rest nor do we generally replenish our soils with all the minerals truly needed. This causes us to be hungry and consumer empty calories in search of the needs of our body. So my suggestion here for this recipe is to dehydrate your walnuts on low temp for day until they are nice and crunchy. You can still stick them in a 400 oven for 10 minutes or so too. But I hope I have inspired you to take the slow way. Walnut Tacos – I love these for the texture, the flavor and colour as it does indeed resemble the typical ground meat you would locate inside your taco shell. Take a couple of cups of dehydrated walnuts and process them in a food processor until they resemble ground meat. Set them aside. Now take a skillet and saute your (on low heat) everything else you normally like in your taco, such as onion, garlic, mushrooms, tomato or salsa. Add in your walnuts at the last minute to mix it all together and just warm them a bit and serve. You can add some vegan cheese on top if you like but they are tasty just with some chopped onion and lettuce over the taco mixture. 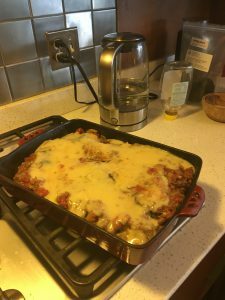 This is a fantastic recipe, given to me by a vegan friend, that is not only delightful in and of itself, but for meat craving individuals, it’s a fantastic transition dish that many, if not told, would not know that it did not contain any meat or cheese in the dish. My husband is a trained executive chef and is an omnivore. I doubt he will ever give up meat, but I do my best to make yummies that do not include meat and dairy as it is a kindness to the creatures. I’ve understood for some time now that our meat consumption wasnt sustainable and encouraged folks to eat meat 2x week or even 2 x a month if possible. We always bought organic and not off factory farms believing the animals were treated better. Not up until very recently, was I clued in that this really isn’t true. For dairy, the mother cows are repeatedly impregnated against their will, to produce milk for us. Their babies are taken away at birth and given powdered milk during their short sad lives. Cows are very social and create strong bonds with their offspring who typically remain with them for years. So I thought I would always eat cheese…but I cannot cause this level of harm and feel good about myself. And the meat, well, even in the best case scenario, which is honestly few and very far between, we are taking a life that truly honestly really wants to live. They know what is happening, they shed tears, they feel upset, they feel fear. They also feel such joy when treated well and allowed to live a happy existence with us. To this end and that of our health (of our bodies, our souls and the planet) I bring you this delightful dish! Enjoy! I did modify the recipe a tad. I used corn starch for the bechamel sauce as I did not have potato starch. We couldn’t find smoked Tofu so I used Trader Joe’s Beef-Less Ground Beef. The texture of this product isn’t bad and it does look like the real thing. This product, by the way, is also terrific in tacos. If you don’t have a TJ nearby, this product, the Ultimate Beefless Ground, by Gardien is good. For the spices, as this is typically a lamb dish, I used Rogan Josh which is a persian spice mix. The above link is less expensive, but there is also one from Penzys Spices, which is actually the one I used for the dish above, which is $13.23 and free shipping. But the other sounds great and is only $9.65 including the shipping. I post links in here to save you time and also money. I try to locate the highest quality and best price on Amazon prior to posting. 🙂 I adore this spice mix which has Cumin, Coriander, Cardamom, Cloves, Saffron and Cinnamon amongst other spices in it. 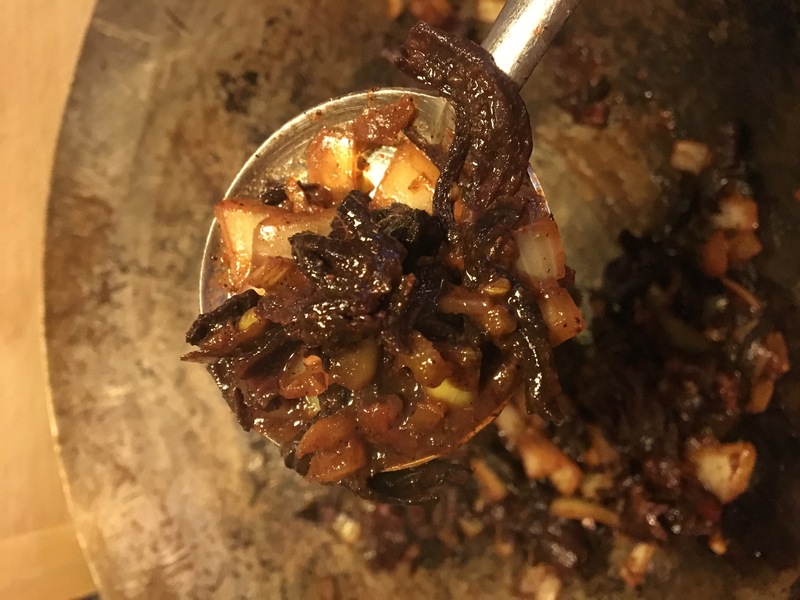 The flavor profile of this spice mix just raises the dish to a new level and I sauteed my garlic and onions till almost caramelized, then I sauteed the spices to amp up that delightful flavour! Drain the tomatoes into a bowl. Keep the juice. Cut the plum tomatoes into small pieces and add to a skillet with their juice. Heat over medium heat until the sauce thickens, about 10 minutes. Stir in tomato paste, maple syrup, salt, pepper and cinnamon and remove from heat. Wash and cut the eggplants into 1-inch think slices, brush slices with olive oil and sprinkle with salt. Fry slices until tender and golden brown on both sides in a large non-stick skillet over medium-heat. Depending on your skillet you can probably fry about 5-6 slices at a time. Transfer the eggplant slices to paper towels. Heat one tablespoon of olive oil in a skillet over medium heat. Add the onions and garlic, and cook until soft, about 7 minutes. Scramble the smoked tofu and add to the skillet, cook for about 5 minutes, stirring every 2 minutes. Add the tomato sauce, mix until everything is combined and remove from heat. Arrange a layer of half the eggplant slices in a greased baking dish (I used a 10-by-6 inch pan). Cover with the tomato/tofu sauce. Top with another layer of the remaining eggplant slices. Pour the bechamel over the top and spread evenly. Bake 25-30 minutes until top is golden brown. Add ½ cup almond milk to a medium sauce pan. Mix in the potato starch, (or Corn Starch), nutritional yeast, salt and nutmeg. Whisk until everything is well combined and add the remaining milk. Heat over medium heat for about 5-10 minutes, whisking constantly until it thickens. Remove from heat. Home Made Vegan Milk – Nut Milks – So Easy! A few decades ago, people were farmers (or knew a farmer) and folks grew their own produce, lived off the land and traded items for what they needed, perhaps an over abundance of Cilantro was traded for carrots. The machine would like us to believe in the grocery store, lock, stock and barrel. While a grocery store is both convenient and necessary for many of us city folk. I grew a garden this year but it was not large enough to encompass feeding our family entirely. So while we want to remain thankful for conveniences a grocer brings us, let’s also seek out local farmers where we can buy directly, too. The reason is because things like milk, orange juice, get pasteurized. When you heat up things as you do to pasteurize it, you may very well kill a bug or two but you are also stripping the product of its natural enzymes. I wont call it carcinogenic, but I will call it severely lacking in the natural enzymes and minerals and vitamins it should have provided you. The Almond milk you buy at the store is pasteurized. The flavor is also thin. And, who knows, really, just how many almonds you are getting in that milk. I bought for years but after my Hippocrates Health Institute Life Transformation Training, I now make my own. And its so super easy, there is little excuse for you not to follow suit! Firstly you should get a nut milk sack/bag. I dont know about you and I sure don’t mean to offend, but the ones I purchased, My Big Fat Nut (Milk) Sacks, offered a bit of humour to the process, as well as being a fantastic product. You want a bag that is easy to clean, roomy enough to hold all the milk and easy enough to squeeze the milk out to separate the nut bits from the milk produced. So start here and if you click on the blue writing, it will take you right there to purchase. The best nuts to make the milks is Almond and, for something heavier, great in tea and coffee, Brazil Nuts! So, when I began making my nut milks at home, I had only ever tried store bought Almond and in my training they spoke of Brazil Nut Milk being so much richer. I went straight to making Brazil Nut Milk only. But I did buy a passel of raw almonds and eventually ventured into giving that a go too because of a recipe that called for it. Well, let me tell you, this is when I discovered that, OMG, the almond milk you are going to make at home is on a whole new level than the store bought in texture and flavour. How To? Firstly, keep in mind that things that do not have the life cooked out of them, actually have a life that can more readily spoil. So get in touch with how much milk you are going to consume within about 5-7 days. Only make enough to use within that time-frame so your milk remains nice and fresh in the fridge. Step 2) The following morning after your nuts have soaked, rinse them and dump them into your blender. Add purified water to the level you desire. Blend for a few seconds, until you see milk and the nuts are good and pulverized into tiny bits. Step 3) Pour the milk from the blender into your nut sack that is sitting in a big bowl. Step 4) Squeeze the bloody hell outta the sack to get all the milk drained from it. Step 5) Now pour the milk into a vessel you will use to store it in your fridge and enjoy! For the pulverized nut bits, you can use that roughage to make crackers or add to a meat loaf (vegan meat loaf is animal friendly) Or compost it. As always, I am here to answer any questions or read any comments you post. Cheers to your health, enjoy! HAIL SEITAN! Preparing Seitan at home is not the devils work I thought it might be. So I said to my husband Michael, hey, wouldn’t be fab humour to put the words ‘Hail Seitan’ on a T-shirt. Then I saw it was already done. What was not yet done was my happy hands in the kitchen preparing Seitan from scratch as opposed to locating it in a dish at a restaurant. Having done it, it is fairly simple. I picked up some Bob’s Red Mill, Vital Wheat Gluten, which is organic I am told. For those of you, like me, who had no clue what this really is or how to make it, it is a great, flexible wheat gluten substitute for meat. Gluten is made from the endosperm of the wheat berry and when mixed with water, it becomes this malleable, elastic food substance. Included on the back of the package of this stuff are two recipes, one for Honey Oatmeal Bread, which I may try at some point, but primarily for this article, there is a great basic seitan recipe. You can also google for fun. But just buying this product and following the instructions on the back make it a breeze for first timers. I will say that for the broth recipe, rather than water, I did it with veggie stock. There is also a delicious organic veggie mushroom stock, which is harder to locate. Mmmmmmmm! That stuff is great in like everything. 6 cups Organic Veggie Stock, try the mushroom one or you can use just plain (purified) water. You boil the broth and while that is getting ready to boil, mix the gluten flour and spice3s, add the water in and stir into a spongey dough. Knead the dough a minutes to make it come together and become more elastic. Next cut it into 2″x2″ pieces and place this into your boiling broth. Cook your gluten in the broth for about 1 hour and lower the heat as needed. Drain and use seitan in stir-fry, sandwiches, stews, etc. And since I am just beginning here with Seitan, if anybody has another fantastic recipe they’d like to share, feel free! So whether you are Vegan, or Vegetarian for health, to save the planet or call yourself a carnivore, there is something in my blog for you! My husband is a master chef and devout meat eater. Rather than cut meat completely and make my husband very sad, we are cutting meat to 2 times a week. When we do buy meat, we make sure it is organic and humanely raised (research the vendor). In this way, I feel it is more sustainable. To put it frankly, the standard American diet (SAD) is absolutely not sustainable nor is it healthy. If you’ve not watched it already, check out Food Inc. With greed now running the food industry, mostly gone are the days where agribusiness cares for we the people, cares for its livestock, rotates crops, rests the soil and farms and raises animals in a humane and organic way. That stated, it becomes important for us to do our due diligence to see whom we are supporting with our hard earned cash. As I do a deeper dive into what we are eating and ways to live healthier, I will post little gems I uncover. If you are already vegan or lacto vegetarian, terrific! But for those who do still eat meat, please try to reduce your meat intake to only 2 days a week and branch out, get creative on ways to better nourish yourself and your family and friends! Top the sprouts with a sprinkle of vegan bacon bits. You have to dig olives to eat this. That stated, I love them and I buy the pre chopped can of black olives as a time saver. Those little guys rolling around on the cutting board get tricky. I use Orowheat Branola Bread for my sandwich. The flavor works well. I also like Tillamook Extra Sharp Cheddar cheese but you can do a vegan cheese etc, as noted above.